Swimsuit season is here, and spending 8 hours a day sitting at your desk can be an added obstacle to optimal fitness. Whether you’re planning a tropical getaway or a staycation, this summer these alternatives to the average desk set-up can improve your health for the summer and seasons to come. Here are a few ways to change up and get moving, making small changes in our behaviors can yield great results! The desk/treadmill combo is becoming a popular fixture among health-oriented companies and workplaces across the nation. Physical activity benefits our ability to focus and contributes to overall mental health; using a treadmill desk just a few minutes a day can give employees a boost and increase efficiency. If a tread-desk is not a suitable option, consider a standing desk. 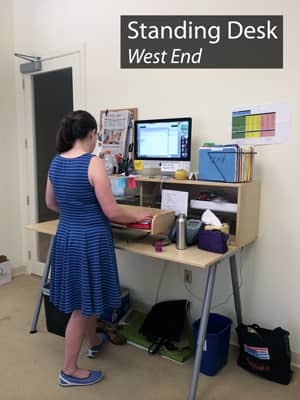 Similar to the tread-desk, the standing desks encourages more movement whether it’s pacing back and forth while you’re on the phone or a step or two when you shift your weight. Studies show that standing elevates the heart rate more than sitting, meaning a greater calorie burn throughout the day. Large stability balls are a great substitute for a desk chair. Not only are stability balls the lease expensive option, but sitting on one targets abdominal muscles and encourages healthy posture. Want to work your muscles even more? Here’s another exercise that you can do with a stability ball: practice sitting on a stability ball and lifting one foot off the floor. Place your foot down and lift the other foot off the floor. Repeat for 20 repetitions. This simple exercise targets abdominal muscles, balance, and posture. Stability balls can also be used in conjunction with specialized stands to create a more stabilized seat. Increase your daily movement at your desk with an elliptical trainer. These small scale machines, sized to fit underneath a desk, mimic the stride of a gym elliptical. They can be used standing or sitting and provide an added activity boost throughout the day. With back and shoulder pain a focus among employees and employers with desk jobs, an innovative set of stools have been developed to provide alternative seating designed to improve posture and spine alignment. From backless options with wobbly bottoms to saddle seats, stools provide a comfortable sitting experience with an emphasis on decreasing back pain. These tools, used for long or short periods of time, make your work day more comfortable and improve your long term health. Working with a business center or an executive suite, these flexible furniture options are available to help your employees perform at their best. 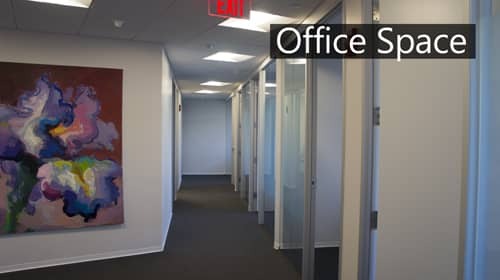 Fitness-focused furniture is just one way to customize your office space with a business center or executive suite! Whether you’re looking to shape up for the summertime or to find relief for continuous back pain by swapping your traditional desk chair, one of these options can help you lead a healthier lifestyle at work.